Enjoy Halloween this year by visiting some of the local commercial haunted houses in Connecticut 2018. It is not the zombies, freaks, vampires, devils, or spirits you need to worry about. These ghosts don’t connect with humans very well. Connecticut haunts bring lots of thrills and terror to visitors in October. Tours and ghost stories runs on October 12th, 13th and 19th. Take a lantern light tour through the historic Mill Hill graveyard. The attraction runs at 6 pm, 7:30 pm and 9 pm. Meet the ghost of a local mobster and a rabies victim. Enjoy a fun evening for all. Bring your flashlight. Sorry folks but they are closed for the 2018 season. Dark Manor opens for its 14th season in 2018. Tickets online are two attractions at one low price. Admission runs $21-25. Featured are The Manor, The Catacombs, and The Haunted Graveyard. Doors open at 6:30 pm. Dark Manor opens October 5th and runs every Thursday, Friday, Saturday, and Sunday nights in October plus some added dates near Halloween. Opens starting September 28th, 2018 and runs every Friday and Saturday nights in October. 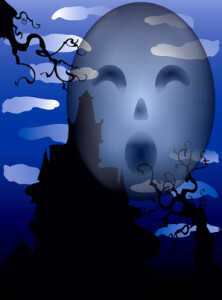 Haunted Isle is really a spooky trolley ride and walk through the haunted woods. The attractions runs from 7 pm to 10 pm on Friday and Saturday nights. Tickets start at $13-15. West Hartford Hauntings is a frightening nighttime tour of one of West Hartford’s oldest Cemeteries. Guests make their way to the North Cemetery on North Main Street, where they meet a costumed guide. The guide leads them through the grounds, stopping at several vignettes which are based on events in the lives of real past residents of West Hartford. The fun begins October 5th. Haunt is held at the Connecticut Trolley Museum on every Friday and Saturday evenings in October. Doors are open from 7 pm until 9:30 pm. Tickets are $20 for non member or $10 for members. Travel the trolley line that opened back in 1906 as it travels through the backwoods of East Windsor. You cannot run away so beware and be very afraid. Enjoy some scary fun starting September 28th. The Haunted Graveyard is a full entertainment experience at the amusement park Lake Compounce. It has been open for 18 years. The Haunted Graveyard runs Friday and Saturday nights from dusk to midnight every weekend in October and until 10:00 pm on Sunday nights. Military and group discounts are available. There are 17 dark rides during this event. Also expect to find werewolves, spiders, vampires, witches, demons, and the Grim Reaper among the many attractions at the Haunted Graveyard. The assortment of attractions includes Reapers Realm, Cemetery, Slaughter House, Cornfield, Bat Cave, Zombie Forest, Jungle, Mayan Temple, Dungeon, Fear of Death, and The Mist. The Trail opens September 29th. The Trail of Terror is an outdoor attraction that has been frightening folks for 20 years. It is the best haunt in the state. Tickets are available for online for guaranteed admission on the night of your choice or remaining tickets are discounted at the door. Doors open at 7 pm and close at 11 pm on Friday and Saturday or 10 pm on Sunday. Trail of Terror runs every Friday, Saturday, and Sunday nights in October. Also check out our list of the Top 100 Haunted Houses 2017 in America. Is your favorite haunted attraction on the top 10 and top 100 state list? If you live in Southwest Connecticut, near Stamford or Greenwich, then you aren’t far from the fabulous New York City haunted houses. And if you live in Northeast CT, you aren’t far from some incredible haunted houses in Rhode Island and Boston. Also check out Funtober’s America’s Best Top 100 Haunted Houses in 2013 (with videos). So no matter where you are located in Connecticut, you are only a few hours from some killer haunted houses. Have you experienced one of these haunted houses? Future visitors would be interested in hearing what you thought. Did you have a good time? Was it worth the money? Would you recommend it to visitors here? Any suggestions to maximize the experience? I’ll gladly publish what you send me and give you a super dooper hug. If you are the owner or employee of a haunted house in this directory, or one I missed and need to add, I would love to have more information about the haunted house, photos, dates/times/hours for 2017, etc. Use the contact form to get in touch and I’ll tell you where to email your answers to these questions. I would like to spend the night in a haunted house and get paid doing it in Connecticut on a weekend. This says “Halloween 2017” but much of this has been re-purposed from previous years. For example, Amity Road Horror was shut down after 2015, when the property it operated on was sold and turned into a soccer field. If anyone has an update, such as this venue moving to a new site, or popping up as something else, I’m all ears, as it was a good one.